Lucy this card is ADORABLE! I have a dear friend that owns a quilt shop in town and I love making "sewing" themed cards for her. I have to buy this kit! Yummy colors, love all the sweet little pearls!! LOVE it, pink and green are sooo beautiful together! sew cute Lucy... sorry couldn't help myself. I am so glad I found your blog. You create such beautiful cards. I most certainly will return for inspiration. 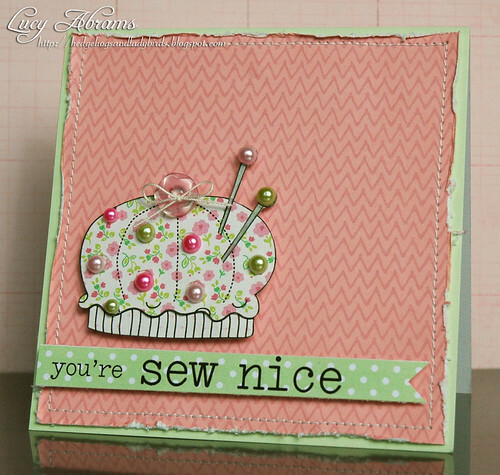 Super cute card - love the colors and the pretty pearls! Love this paper pierced pin cushion!